No matter how busy things get, I can always steal a few minutes to spend in my little in-house clay studio (usually in the very early morning when it’s still dark). 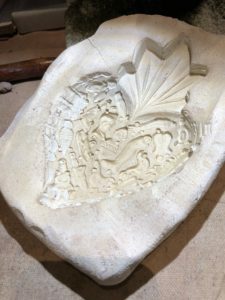 There is such comfort and calmness in claywork, kinda like meditation. The space is about 7×10′ – it’s very cozy. I can slip into my chair at the clay table and lose myself in the comfort of hand building earthenware when there’s an extra 30 minutes or so. A couple of weeks ago I had a Milagro Moment – aha! 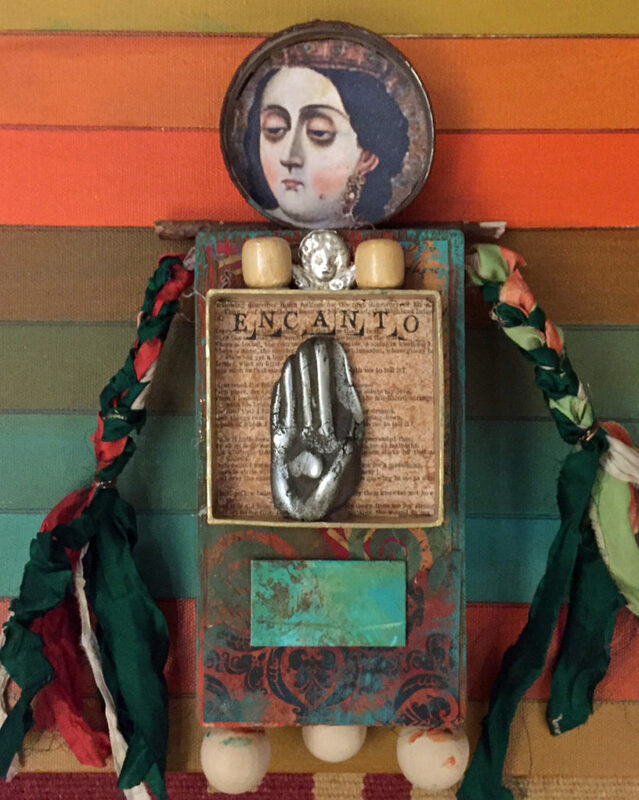 You know, or course, that milagros (miracles) are those little charms that adorn altars and artwork all over the Southwest and Mexico. 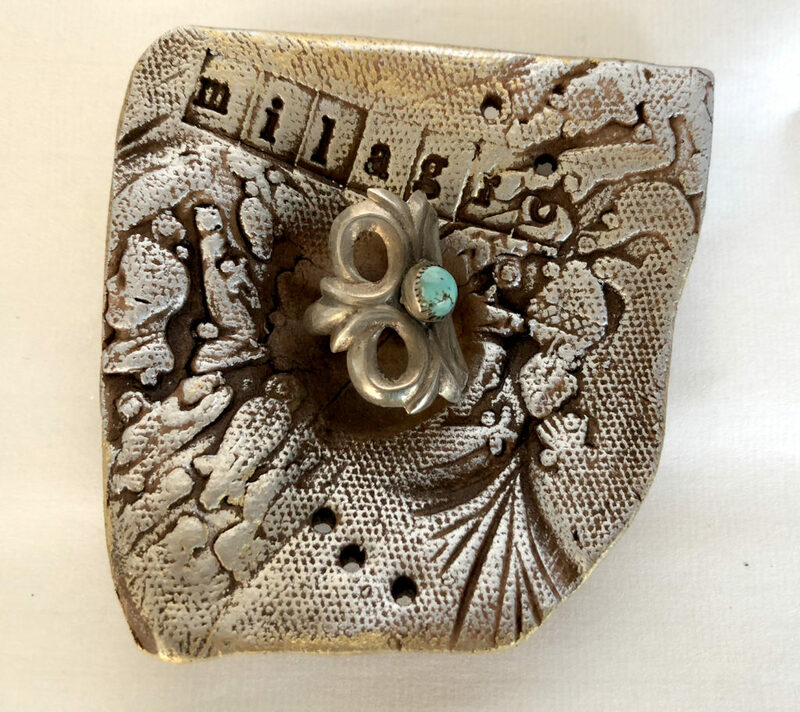 What if I made a clay press mold from milagros just like I do from cemetery faces? I could fire it and use it for all kinds of milagro textures. 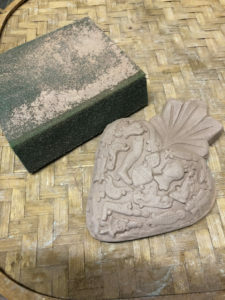 Here is an unfired earthenware heart taken from the press mold – I sanded it to refine the shape. 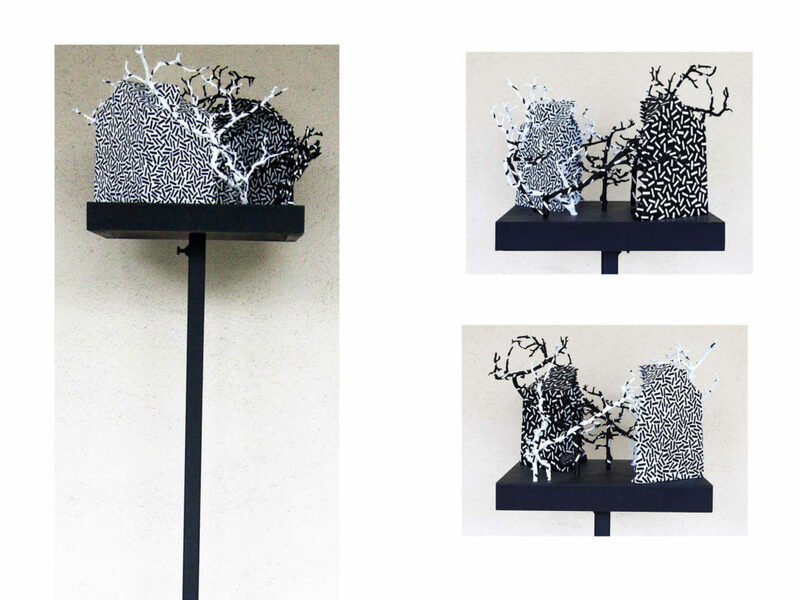 I can also incorporate the clay shape into other assemblages. 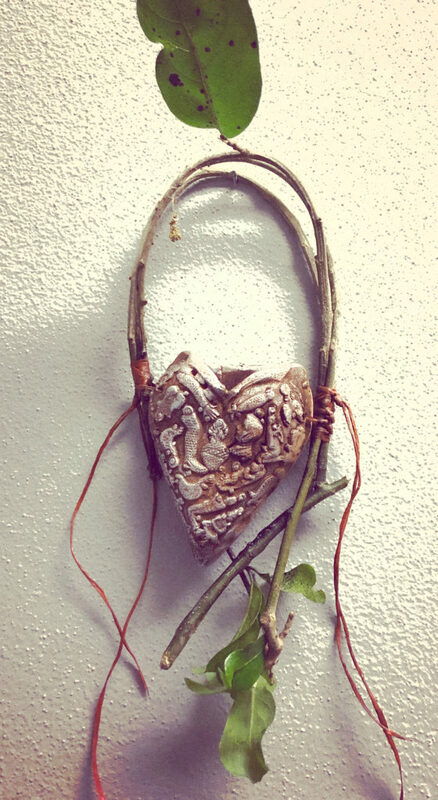 This one, a personal altar adornment was finished last night. The detail that clay can replicate is pretty amazing – I’m using Longhorn White with Grog to form the press mold and firing it to Cone 05. 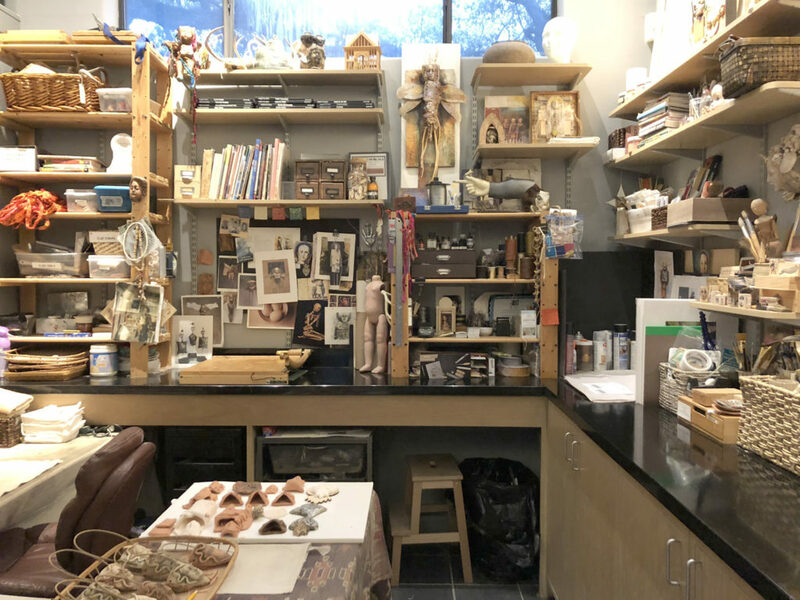 Making clay objects has been my go-to comfort practice since the late 70’s when I took handbuilding classes from Jerry Alexander at the old San Antonio Art Institute. Some of you remember that time! 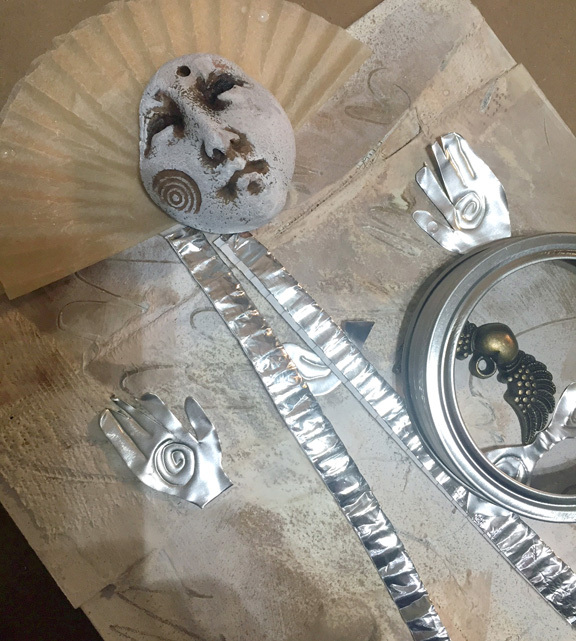 So getting grounded by working with earthenware always helps me find those Milagro Moments – new ideas that keep the enthusiasm for the next creative experiment alive and well. So, what’s YOUR next Milagro Moment?? 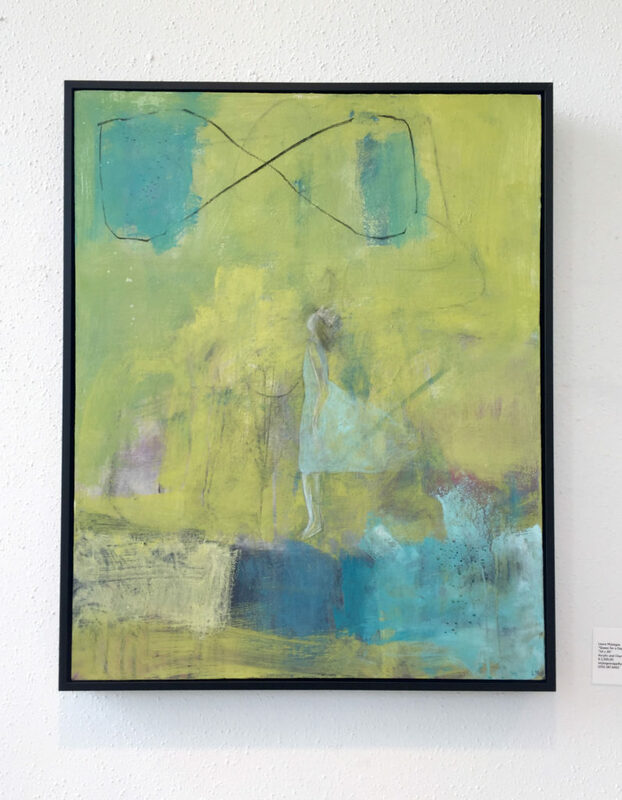 This is a follow-up to the Borderland post – the GAGA group show titled “A Certain Sense of Her” opened yesterday at the Coastal Bend College Gallery in Beeville, Texas. 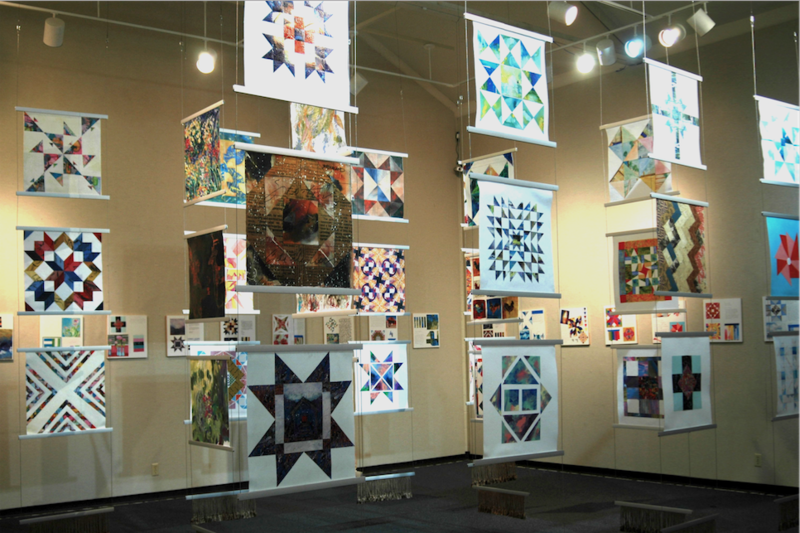 In this photo, you are viewing the “quilt” sides of the paintings. Don’t they look amazing? Kudos to Sylvia Benitez and her GAGA installation crew for this great display. You may remember that I was working on the reverse side of my “Borderland” painting in a recent post. 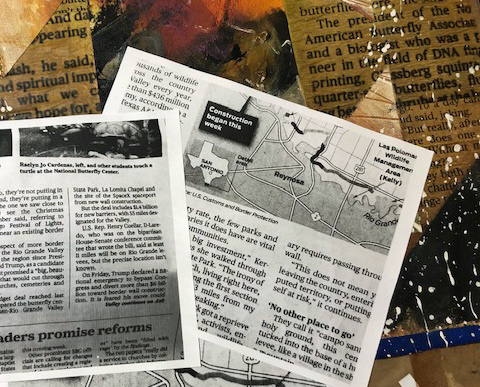 I decided to intersperse photocopied newspaper stories about the struggle on the border with canvas fragments from the palette I used while painting the front. I wish I could have been in Beeville yesterday! But fortunately, Sylvia and the GAGAs posted a video of the installation. Just go the the GAGA homepage and scroll down to the video on the right. You’ll get a great inside view of the scope and drama of the installation. I am so proud to be a part of this talented group of women! 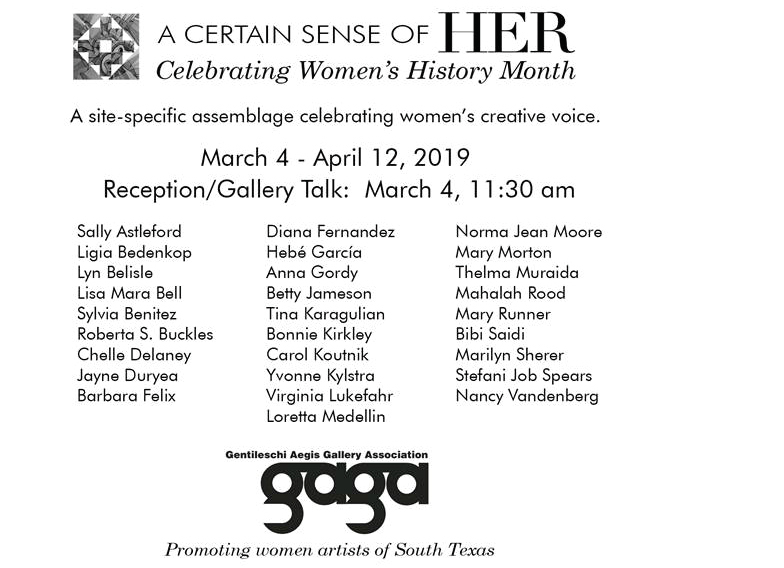 The amazing Sylvia Benitez, founder of the Gentileschi Aegis Gallery Association, (GAGA) has devised a new group painting installation for the COASTAL BEND COLLEGE Gallery in Beeville. 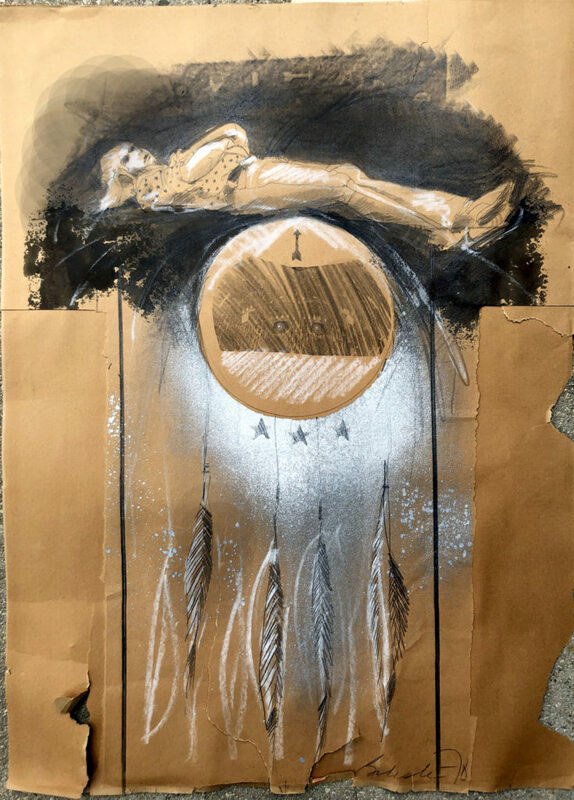 This was the small sketch for the larger painting in close-up – it was just a general idea that I hoped to develop somehow — in my notes on the maquette, I wrote, “I have come to rely on synchronicity, intuition, and collective unconscious” – in other words, I try to trust the process and the concept will emerge. 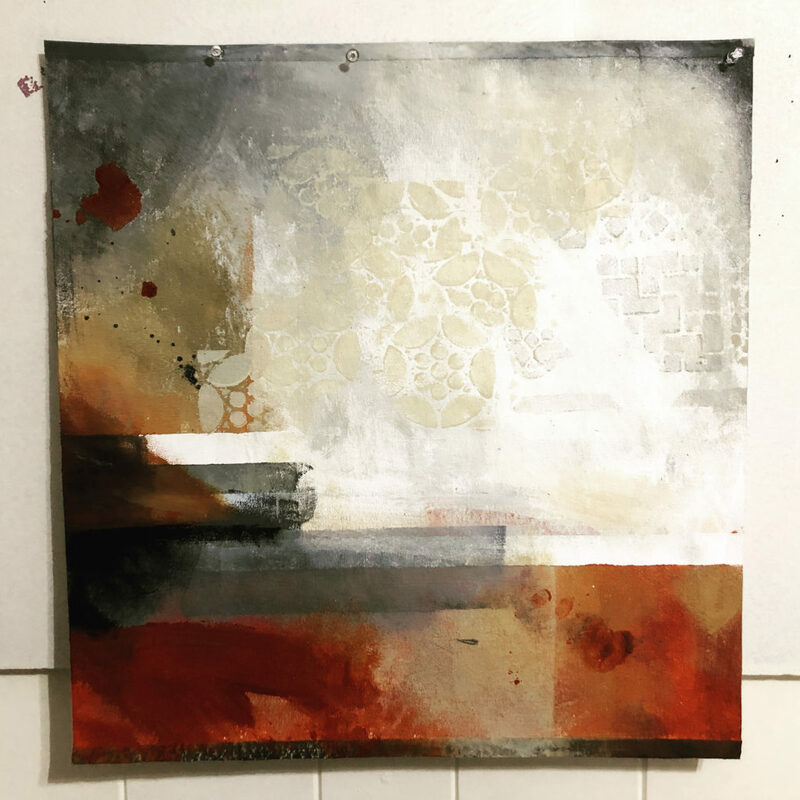 The next step was to create the painting itself, a 20×20″ work on unstretched heavy canvas with six coats of Gesso. 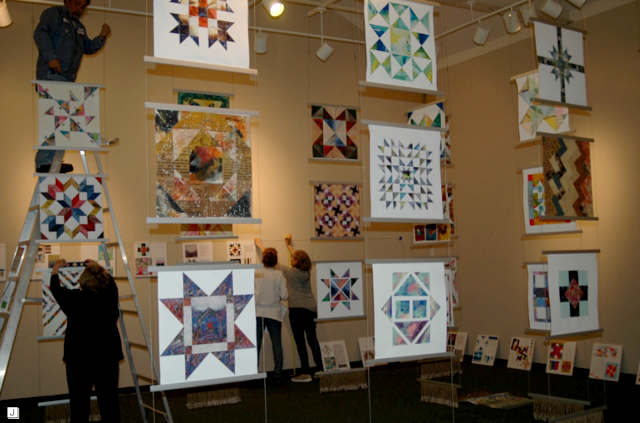 One of Sylvia’s brilliant ideas was to use a separate canvas for the palette, which could them be cut up into a quilt design that would reflect the colors in the painting. At this point, I posted on Facebook that I liked the palette better than the painting! 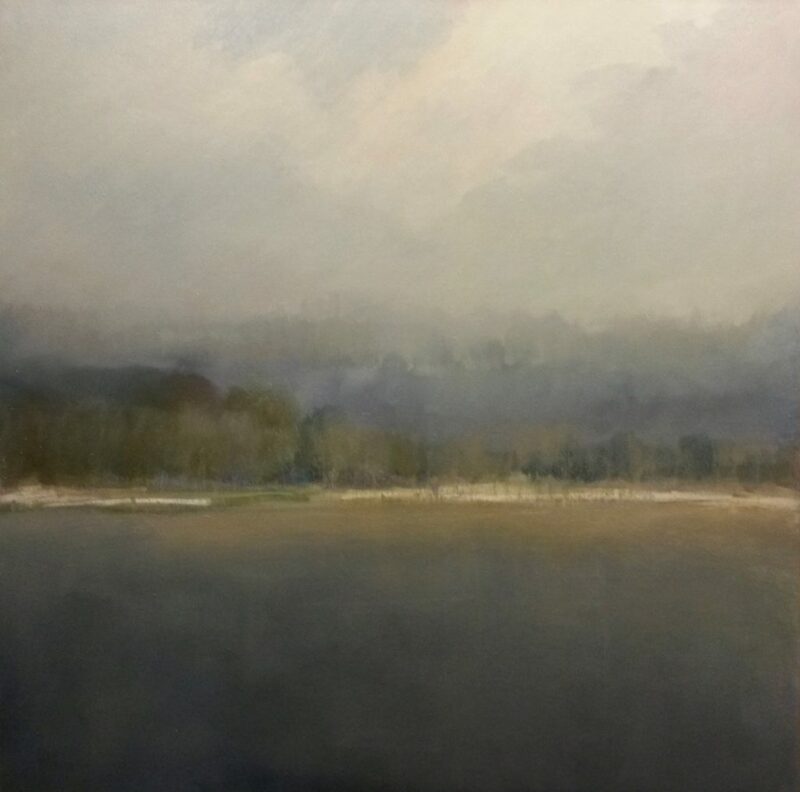 You can’t go wrong with Quinacridone Gold and Payne’s Gray! 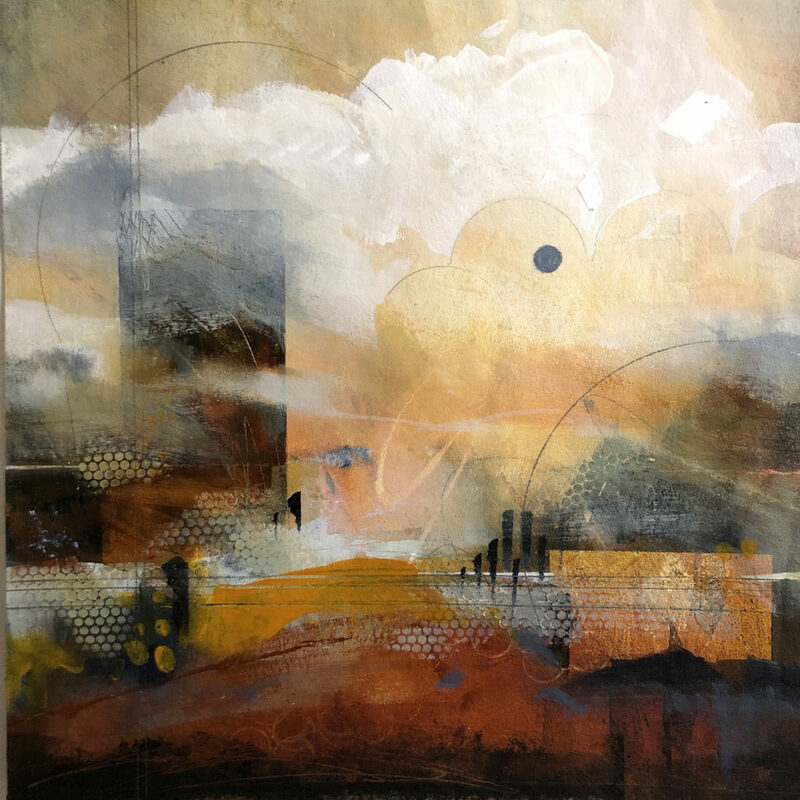 Then the painting got to that stage where things get murky and uncertain – I had imaged that it would be misty and soft, but more geometric shapes seemed to be called for. I almost stopped here. The painting was pretty – but that’s ALL it was. There had to be more . . . 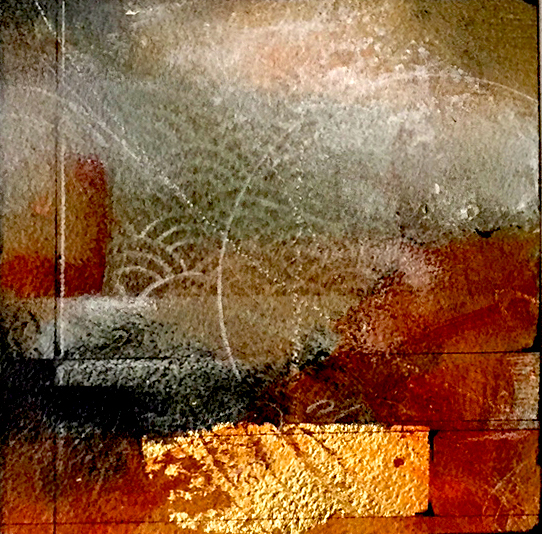 I realized that the painting was becoming the abstract representation of a borderland in turmoil – fences, walls, wire, smoke. Just yesterday I had seen photographs of a bulldozer at a protected butterfly sanctuary on the Mexico border. I am so grateful for the intuitive guidance that helped me express the frustration I feel about divisions and conflict. It’s cathartic to paint it through. Every little dab and brushstroke in the finished piece now has new meaning for me. The next step will be to cut up the painted scrap palette I used, and create a quilt collage on the back side of the canvas. I’ll post a photo for that when it’s done. 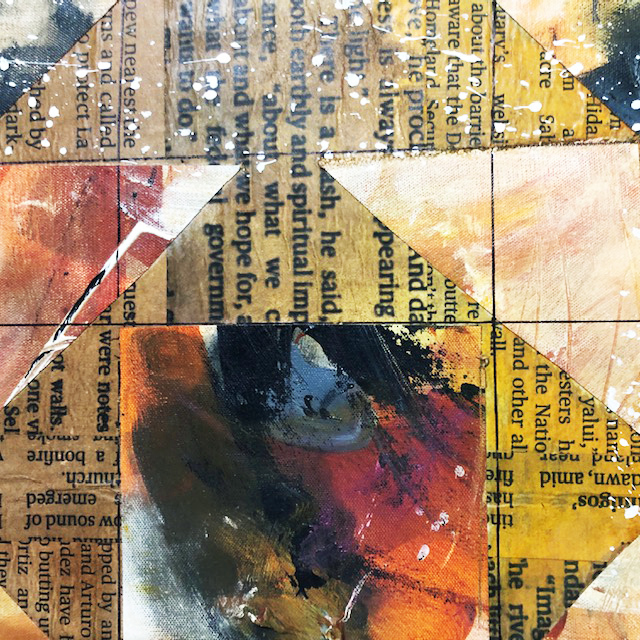 Sylvia’s vision for our GAGA group show, A Certain Sense of Her, should play out well at the Coastal Bend Gallery – can’t wait to see all of the quilted-inspired paintings on site! 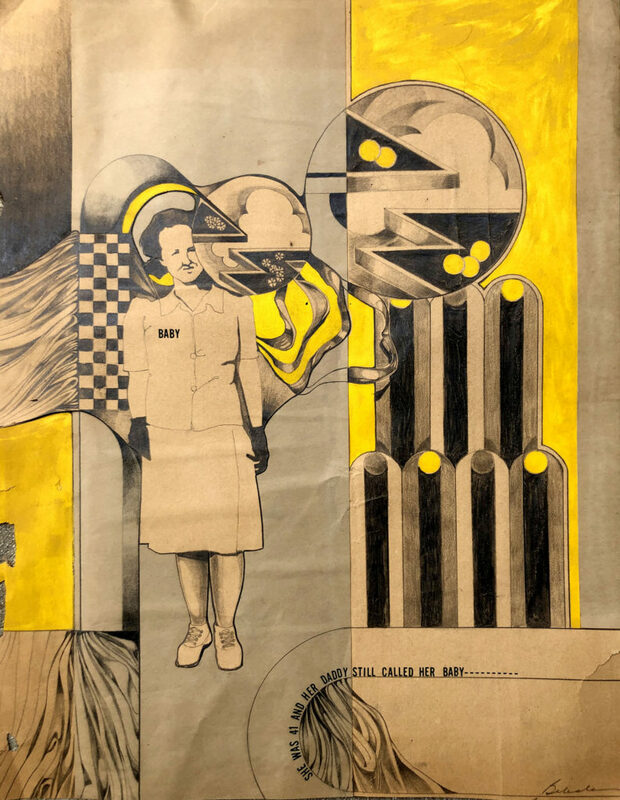 I just came across a portfolio of old mixed media drawings that I hadn’t seen in decades. The year was 1978. I was teaching art at MacArthur High School and working part-time as an illustrator. Even though these nine pieces are 40 years old, I can still see my style in development – narrative work, limited palette, graphite. And there are lots of Jasper Johns and Larry Rivers influences, which I cherish today. 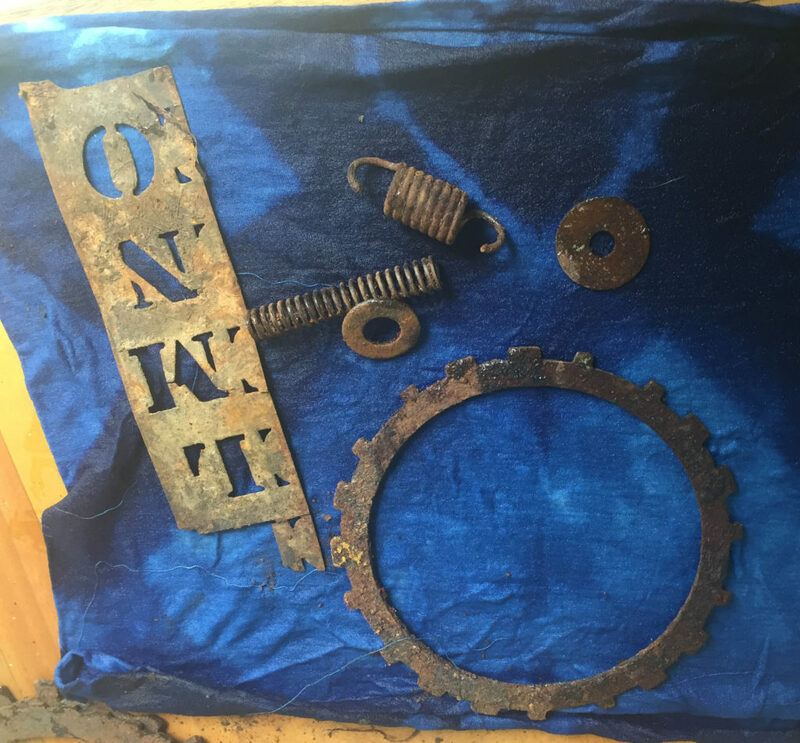 Each piece is fairly large, 18″x24″. The are done with Ebony pencil, watercolor, even spray paint. 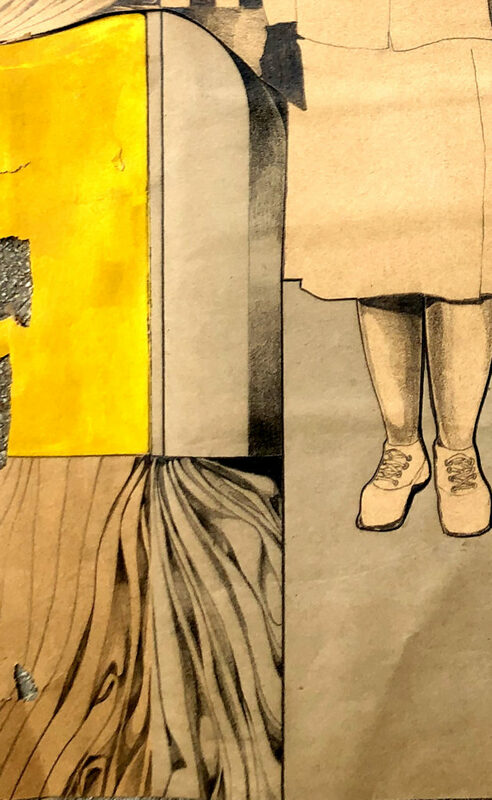 Most of the drawings are in good shape – however . . . . 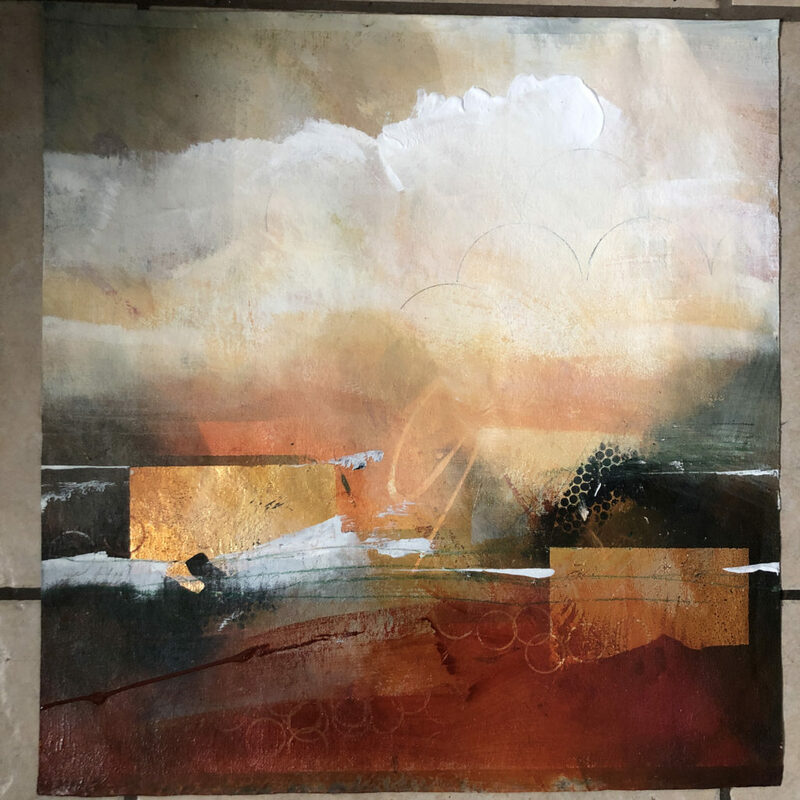 Unfortunately, I created this layered piece on manilla paper, which is made from wood fiber and is anything but archival – you can see on the left side how it’s crumbling and disintegrating. In 1978, I had no idea that I’d be looking at this work 40 years later, but I’ve certainly learned a lesson about archival paper! These days, we can photograph old works and “repair” them digitally, but it’s always a good idea to think ahead and use a substrate that will stand up to time. Here is a great article on archival paper from Making a Mark blog – I wish I had read it 40 years ago. Oh, wait, there was no Internet back them . . . .
Weeds are my heroes. They are tenacious, enduring, simple, and elegant. 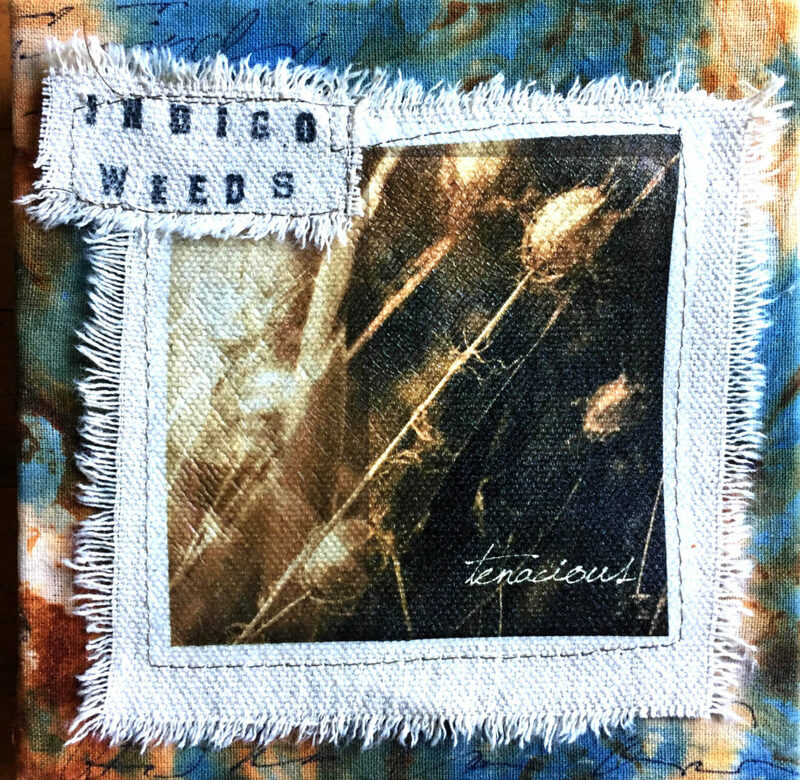 “Indigo Weeds” is my new series of small works celebrating these wild, determined plants that are the ultimate survivors. 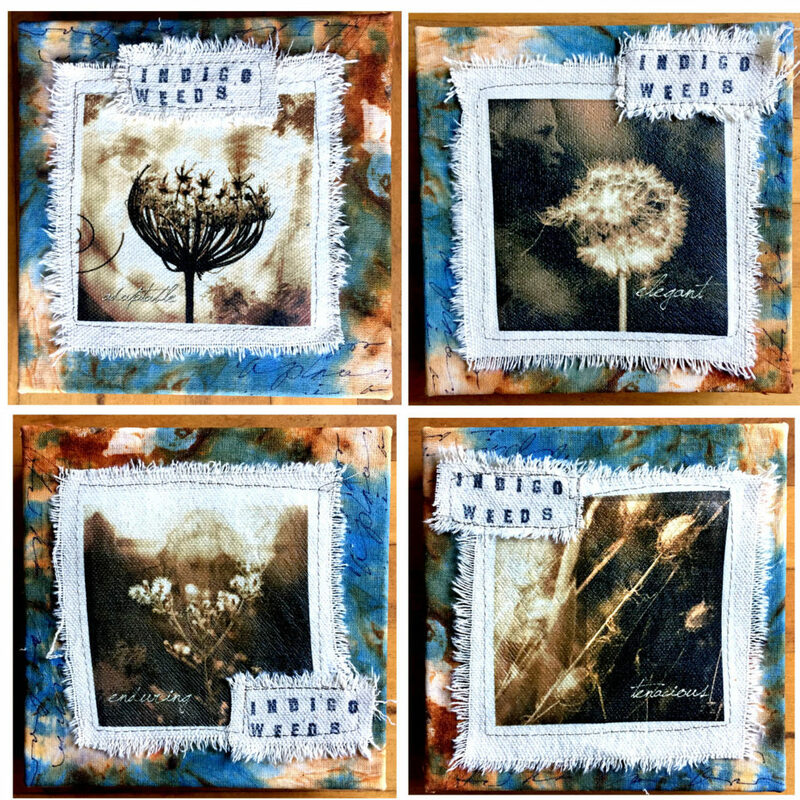 Process: I made enhanced photographs of weeds, then phototransferred them onto sections of torn canvas dropcloth from my studio.They were designed to be stitched into place on a cloth-covered stretched canvas. 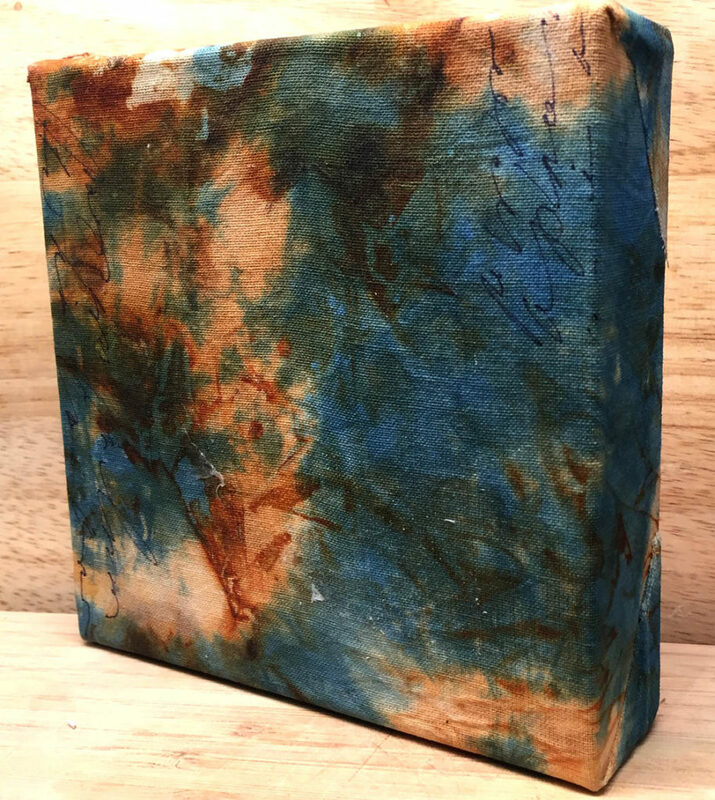 It seemed appropriate to build these little fiber works on canvases covered with fabric that was hand-dyed with indigo (a plant related to beans) and then rusted with common metal objects. I liked the nature-inspired symbolism. 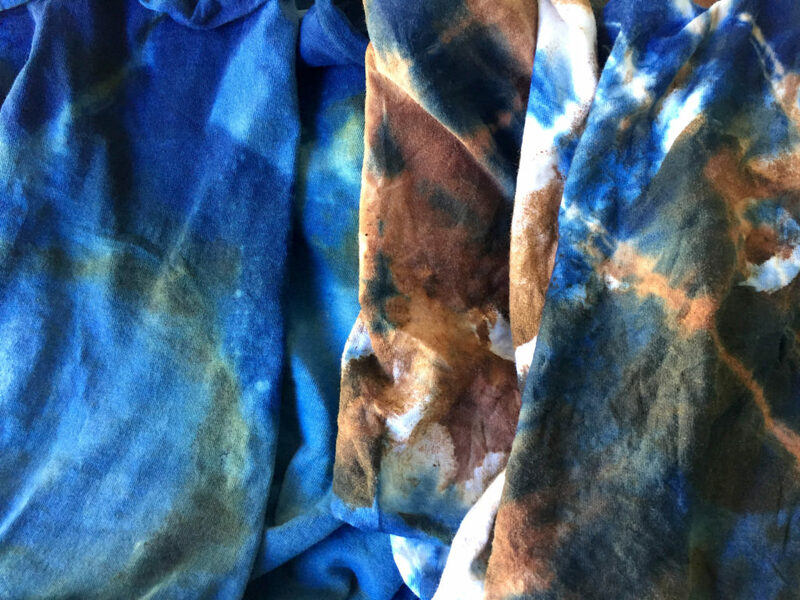 Hand-dyed indigo cloth for the covering was no problem – I had plenty left from teaching previous workshops on dyeing with indigo. Remember this one? But rusting the cloth afterwards can be tedious. 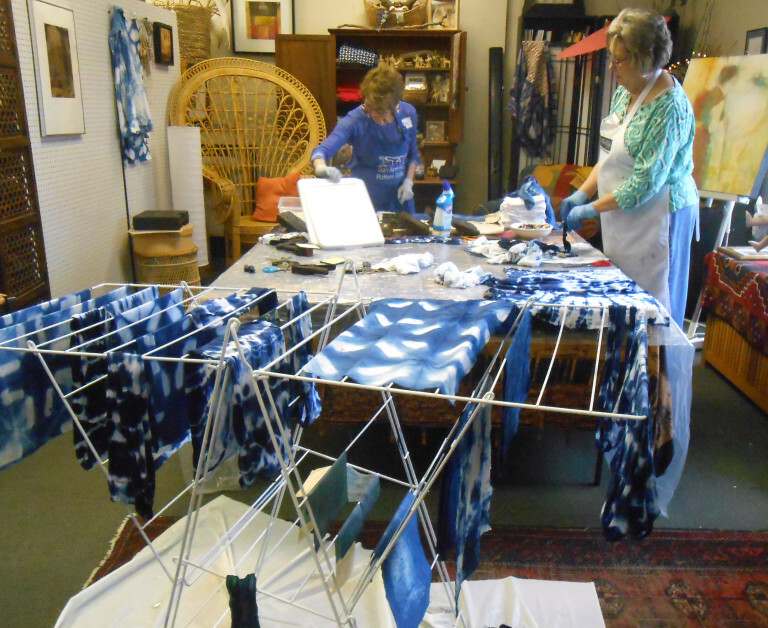 It has to be done after the indigo dyeing so it won’t corrupt the indigo vat. 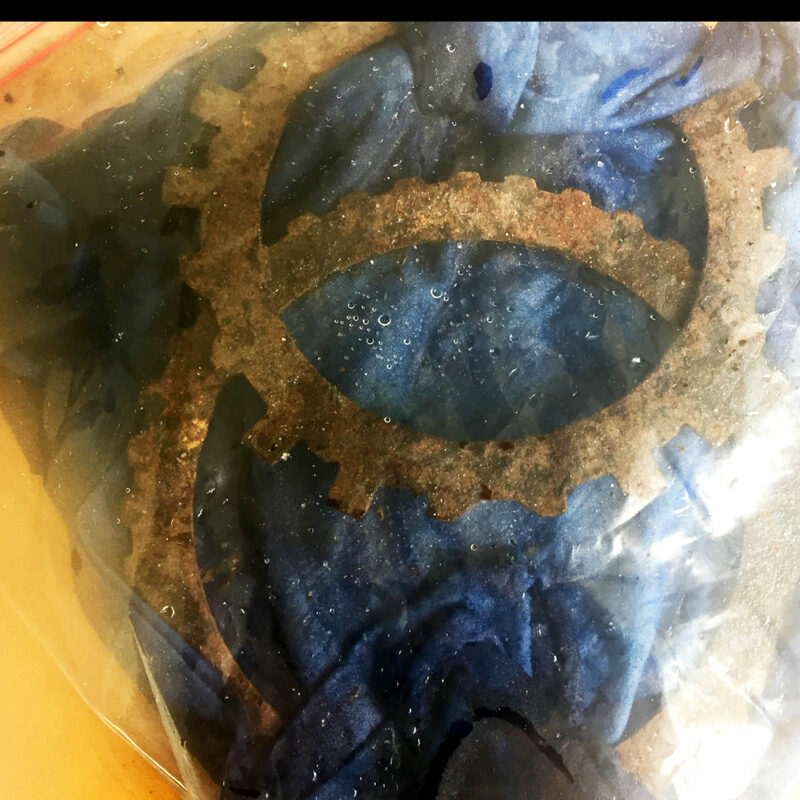 I first tried my usual method – wrapping rusted objects in the vinegar-soaked indigo cloth after sprinkling a layer of salt on everything, then leaving it overnight sealed in a plastic bag. Time-consuming . . . .
As always, the results are unpredictable, but that’s part of the appeal of the process. However, I had a real AHA! 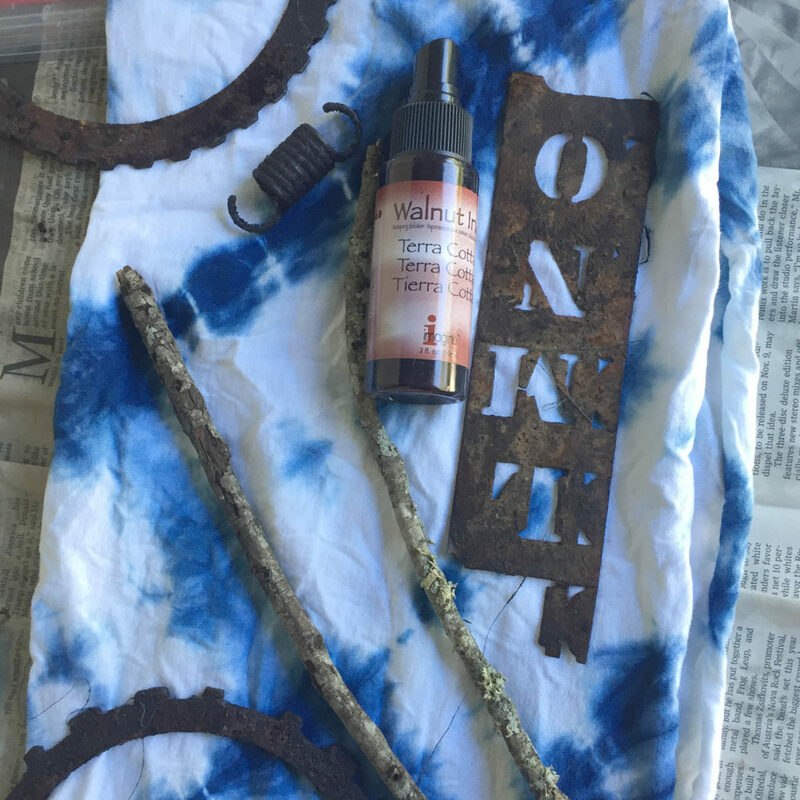 moment in the middle of all this – wouldn’t terra cotta walnut ink mimic the rust effect? And it might be an even more appropriate material to use because it is plant-based! 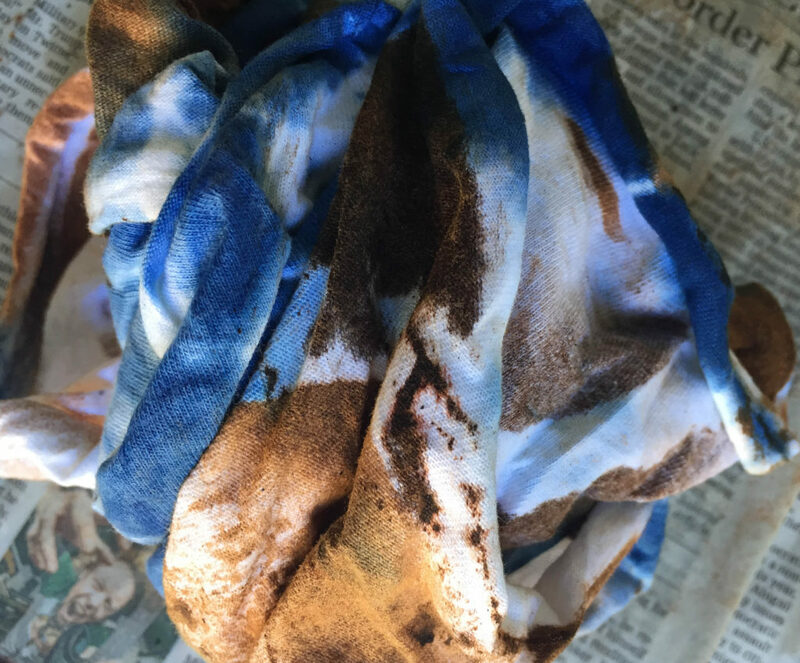 Here are photos of the walnut ink being sprayed onto the indigo cloth – I used rust objects and found objects to create patterns. TIP: If you scrunch up the walnut-ink-sprayed fabric while it is still damp, it will soften the pattern edges and give a more natural result. 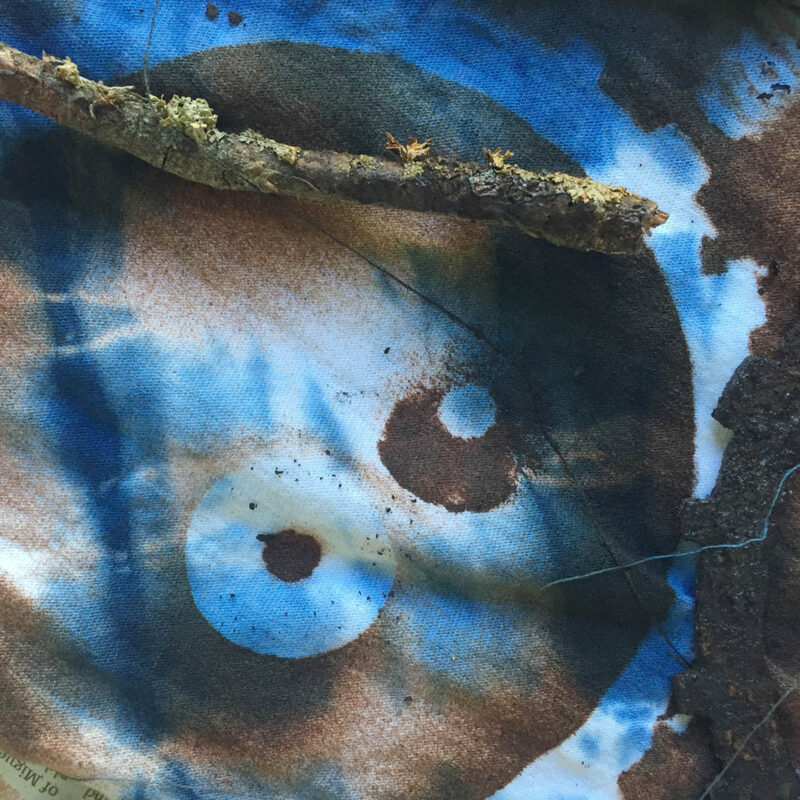 The walnut ink finish is not a washable process for garments and will fade (as will “real” rust) but I love it because it is fast, engaging, slightly more controllable, and – plant-based! For my purpose – celebrating the tenacious, adaptable, unbeatable weeds of the world – it’s perfect! 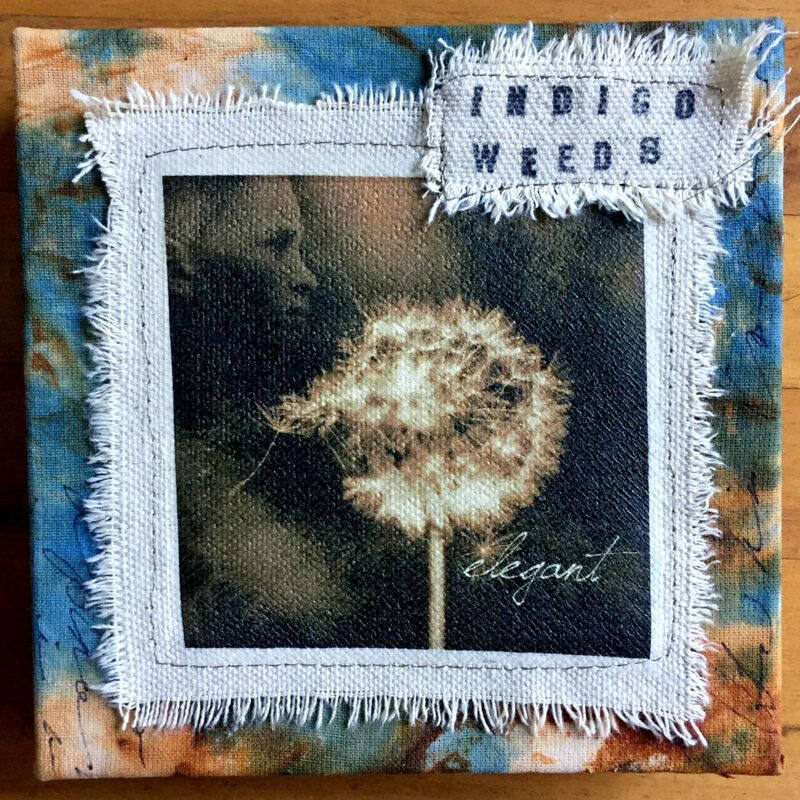 The Indigo Weeds series will be available at the Pop-Up Gallery at SAY Si during the 44th Juried Fiber Arts Exhibit at Say Si Art Gallery, located at 1518 S. Alamo St., San Antonio, TX 78204. 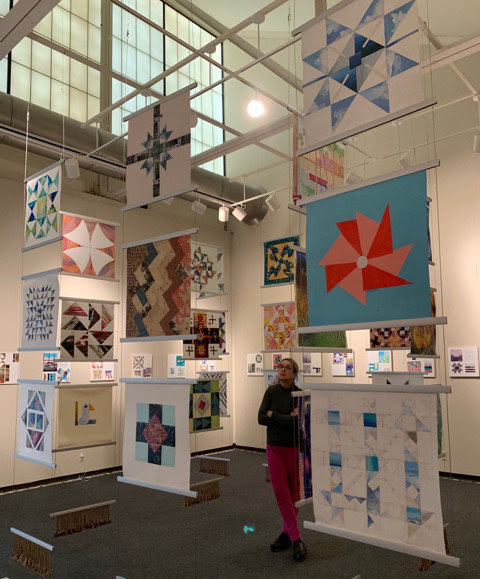 Art will hang December 7, 2018 to January 25, 2019. Oh, and guess who got into the show?? Yep, Boro Horse! You can see him, too, when you come to the FASA exhibit! And now, ONWARD! 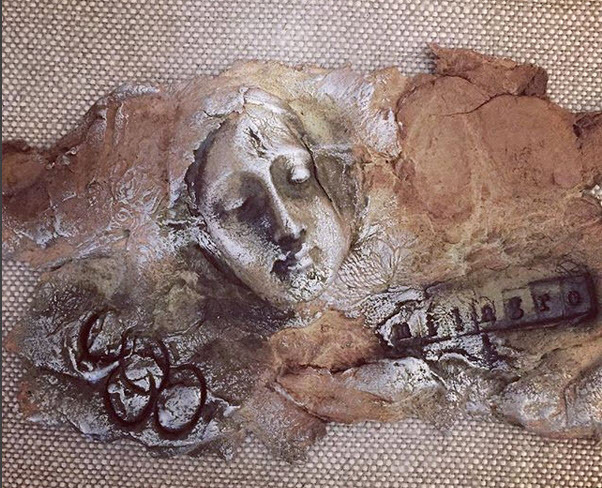 About paper clay — Leslie Newton (of the San Antonio Potters Guild) and I are teaching a workshop this Saturday at the San Antonio Art League on paper-infused clay. This is a new clay product for me. It’s not the same stuff as Creative Paper Clay. 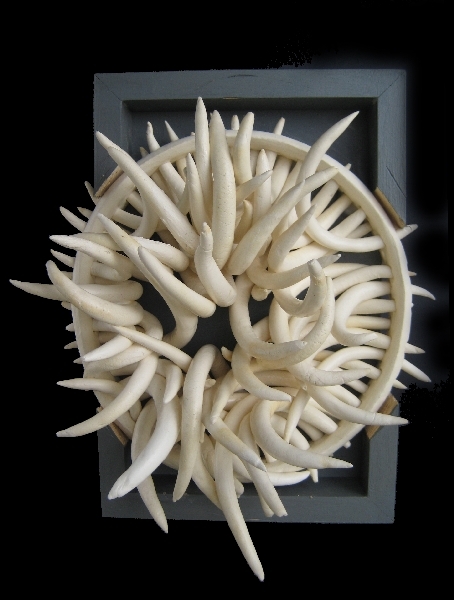 This is porcelain or earthenware clay body combined with paper fibers, and needs to be kiln-fired. Leslie mixes her own and fires it to about 2200F. 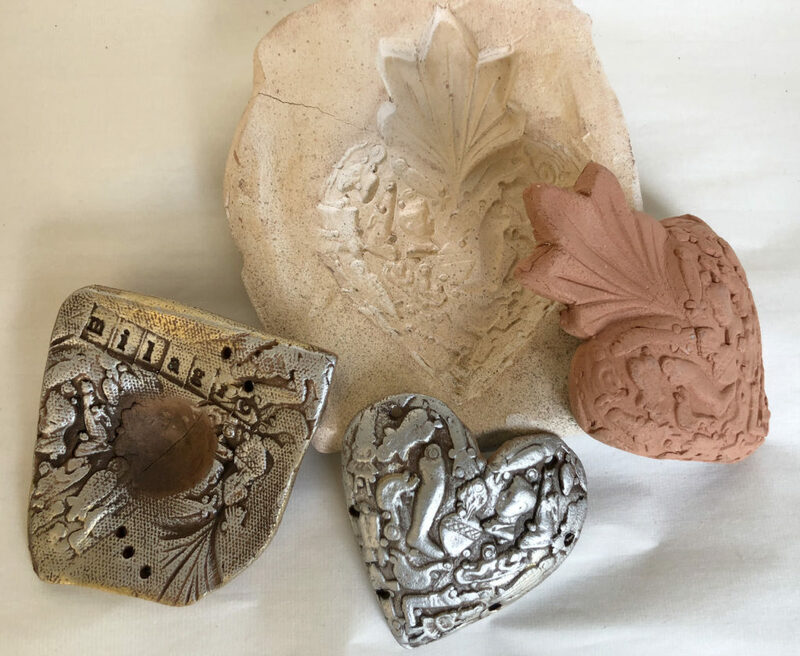 I used Leslie’s clay mixture to make some small ornamental examples for our workshop. I fired mine to 1900F and got some nice porcelain-like results. Apparently, there are a lot of different formulas for paper-infused clay. Last week I went to Roadrunner Ceramics and bought a 25-pound bag of their “bone paper clay.” It’s weird stuff, more fiber-y than Leslie’s mix. It’s quite squishy and pulls apart in ragged layers. 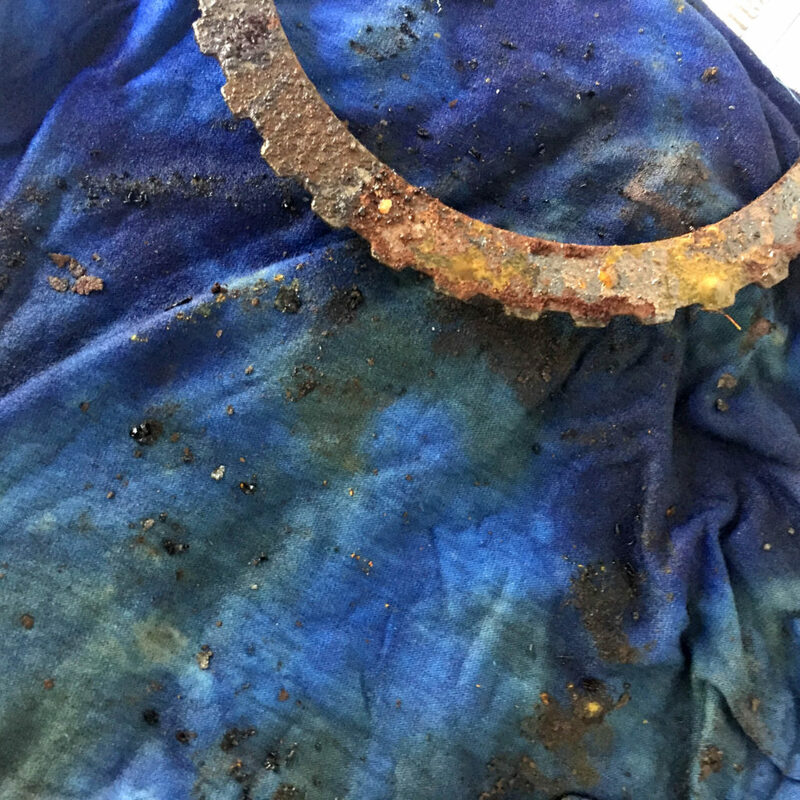 Here are some pictures of the good and bad things I found out as I worked with the clay – because it has paper fibers, it can get stinky black mold in the clay body (which you can spray with Clorox to kill). However, because of those fibers, you can work with very thin slabs of clay! Some of the edges look as delicate as paper, but they are sharp because they’re fired clay! I believe the fiber burns away in the kiln leaving just the clay-coated texture. 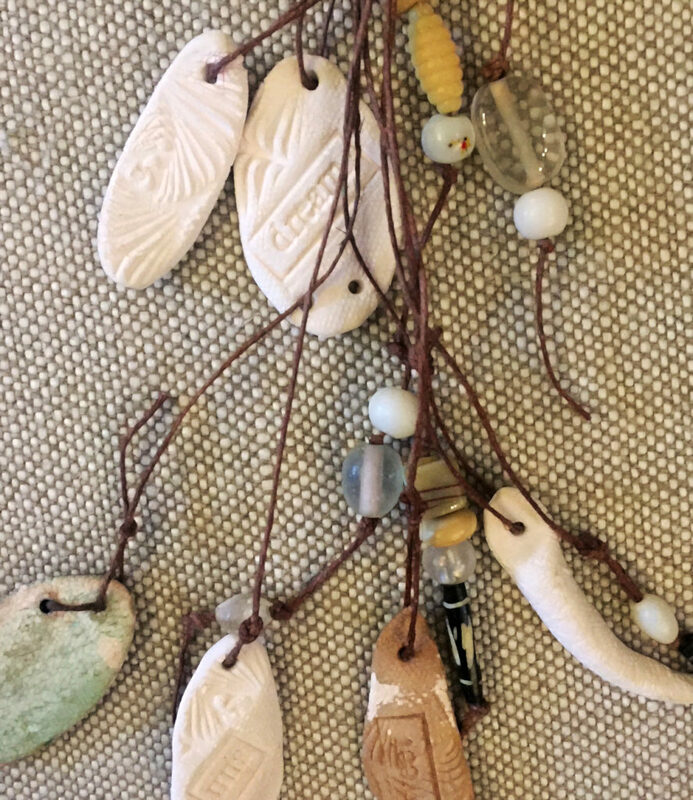 In a SHARDS post last year called “Lotus and Clay”, I mention that Leslie and I love Roadrunner Ceramics as our go-to clay store now that Clay World has closed. Even if you’re not a potter or ceramicist, they are super nice to their customers and encourage questions from everybody. OK, I’ve saved the best for last. 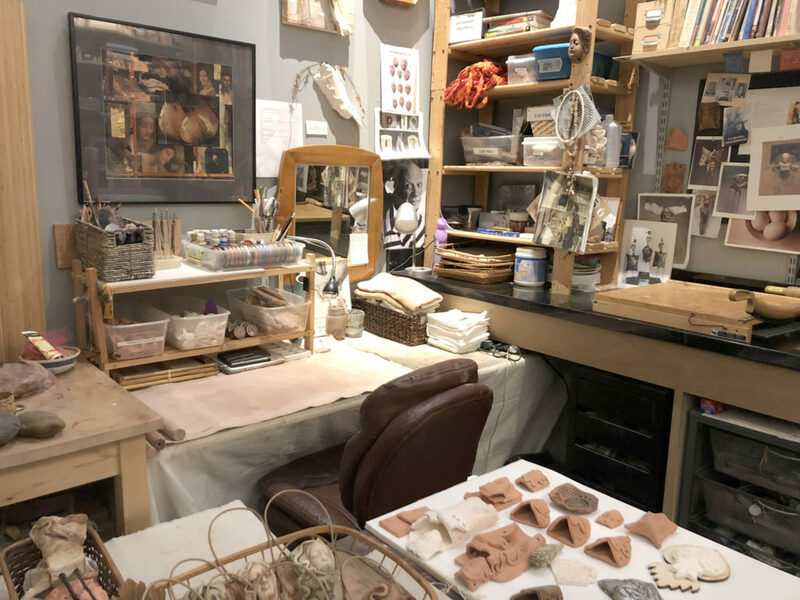 When I was looking around for materials about using paper-infused clay, I came across potter Danielle Bluestone of Magic Bus Studio – you gotta watch this – she is my new hero. 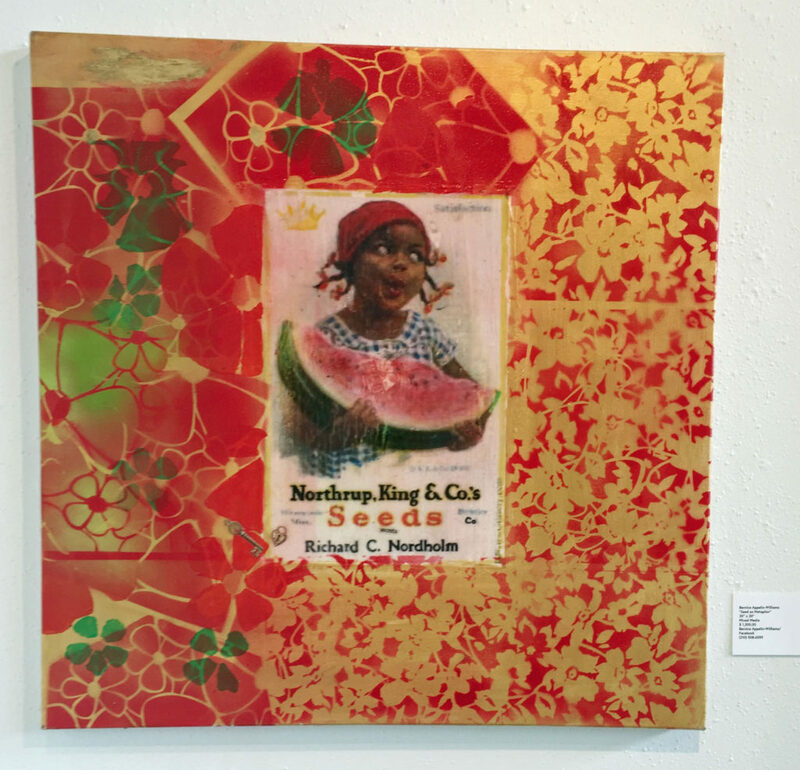 Congratulations to Michelle Belto and her seven fellow artists for a visually diverse, culturally rich exhibit called Exchange Project now showing at the Carver Community Cultural Center until September 14th. I strongly urge you to make time to see it. The premise is fun – what was your childhood San Antonio telephone exchange name? Taylor? Pershing? You could tell where your friends lived by their phone number prefix. Exchanges defined both the geographic and demographic qualities of those San Antonio neighborhood. 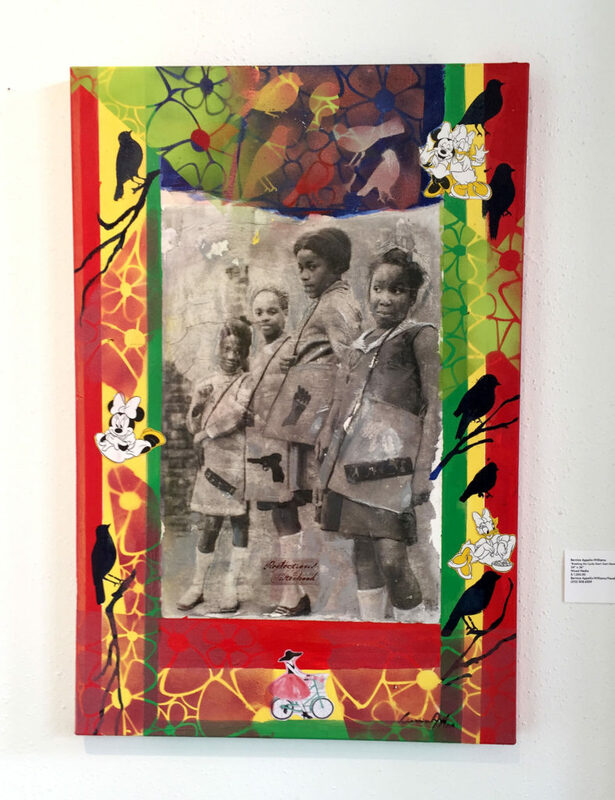 Each artist in the exhibit expresses an authentic sense of childhood and local neighborhood, and each one is different in both media and metaphor. 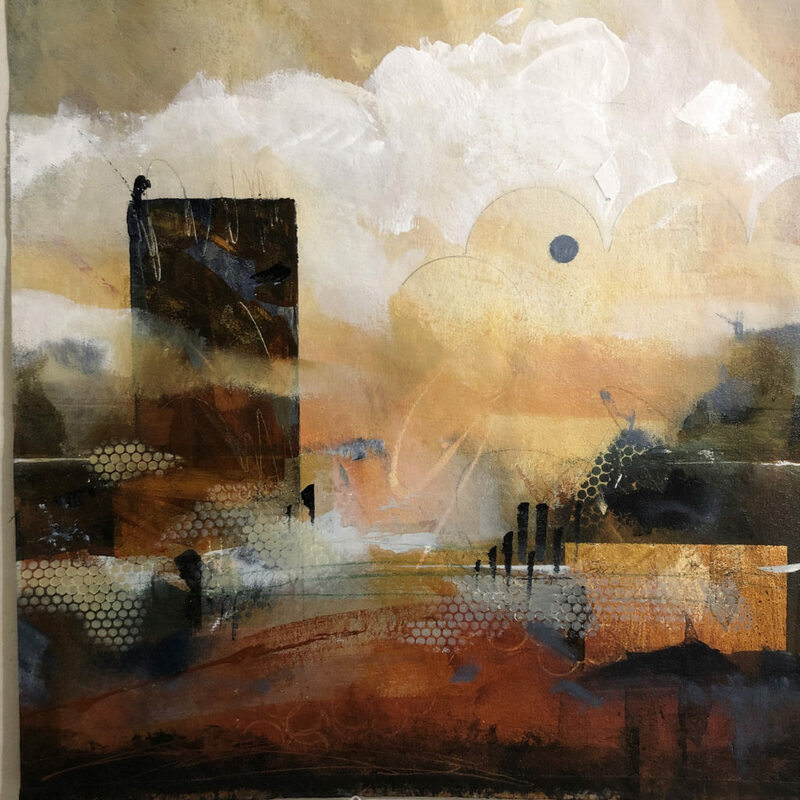 Laura Mijangos provides a visual contrast with her paintings, which are mysterious and misty, much like childhood memories. Again, the metaphor – an infinity sign floating like a jump-rope above the paint-veiled child. 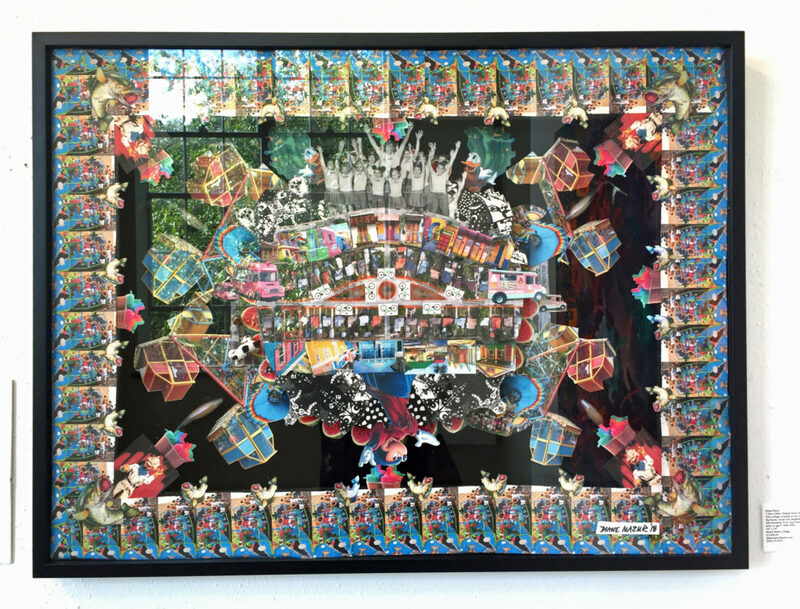 Viewers could spend forever exploring Diane Mazur’s large mixed-media collage which is filled with symbols and memories of her childhood house at 400 Mandalay Drive. I loved its complexity and composition, its constructed levels. And it’s no secret how much I love Michelle Belto’s work. She chose to construct a “neighborhood” of three-dimensional houses with wax and mixed media, each with its own clues about the inhabitants. Michelle is a marvelous artist and creative craftsman. 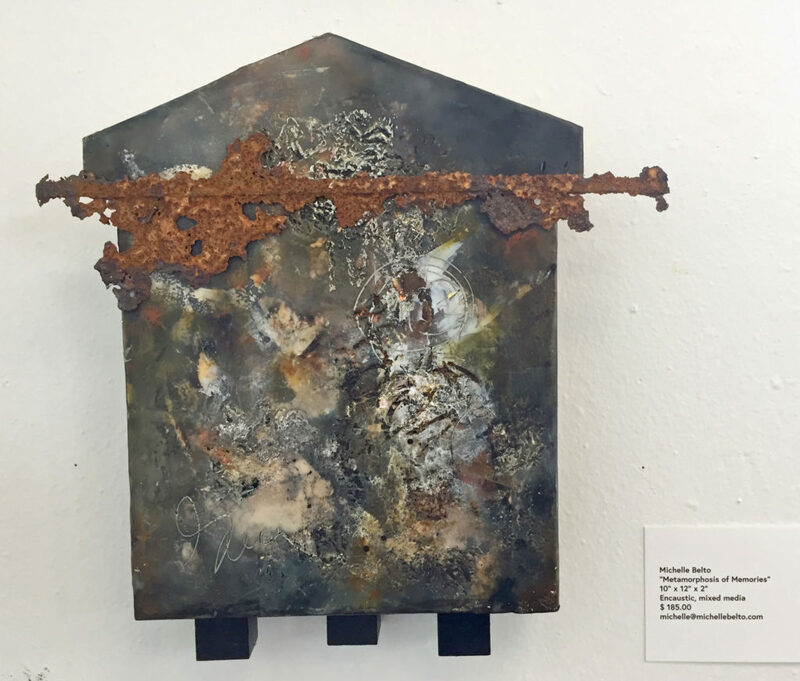 Other artists have equally compelling work in The Exchange Project – RitaMarie Contreras, Thelma Muraida, Patricia Ortiz, Sandy Whitby. 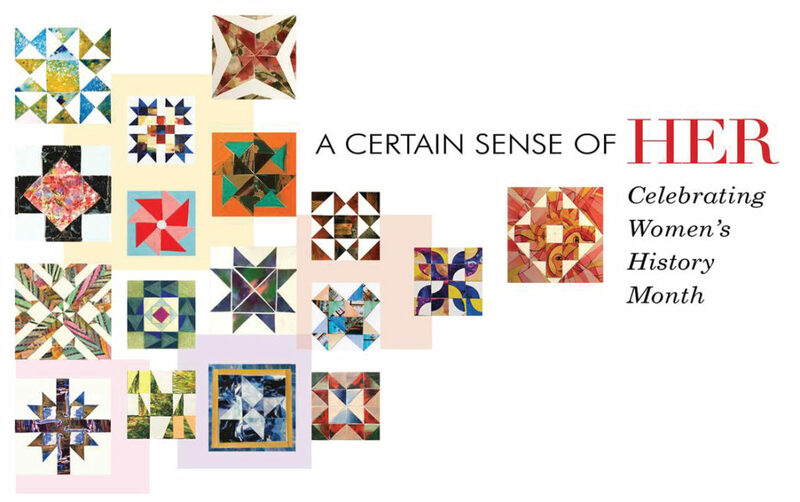 This exhibition is delightful, thoughtful, and diverse. Please go see it, especially if you grew up in a San Antonio in the 50’s and 60’s – but the work truly speaks to everyone on every level. There’s plenty of parking around the Carver, and it’s easy to get to. Give a bunch of cool poets some hot beeswax and whaddya get? 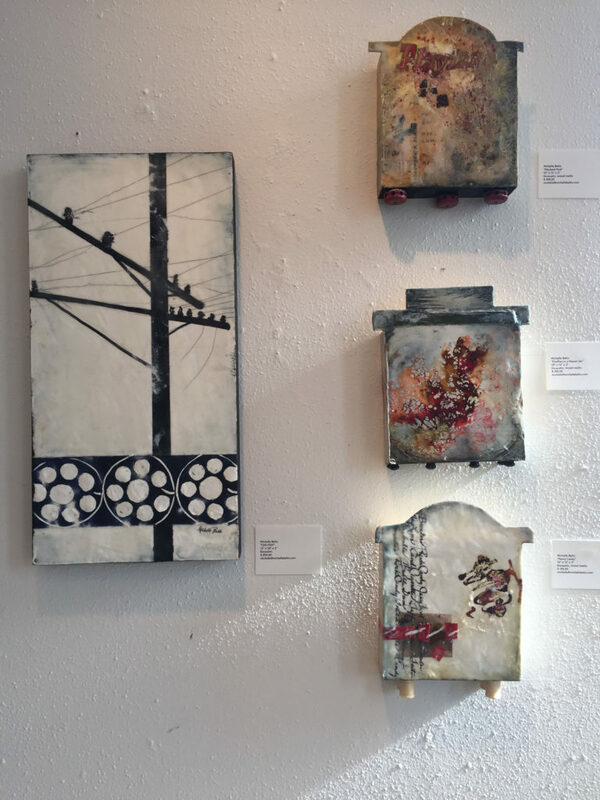 A very nice collection of encaustic collages! 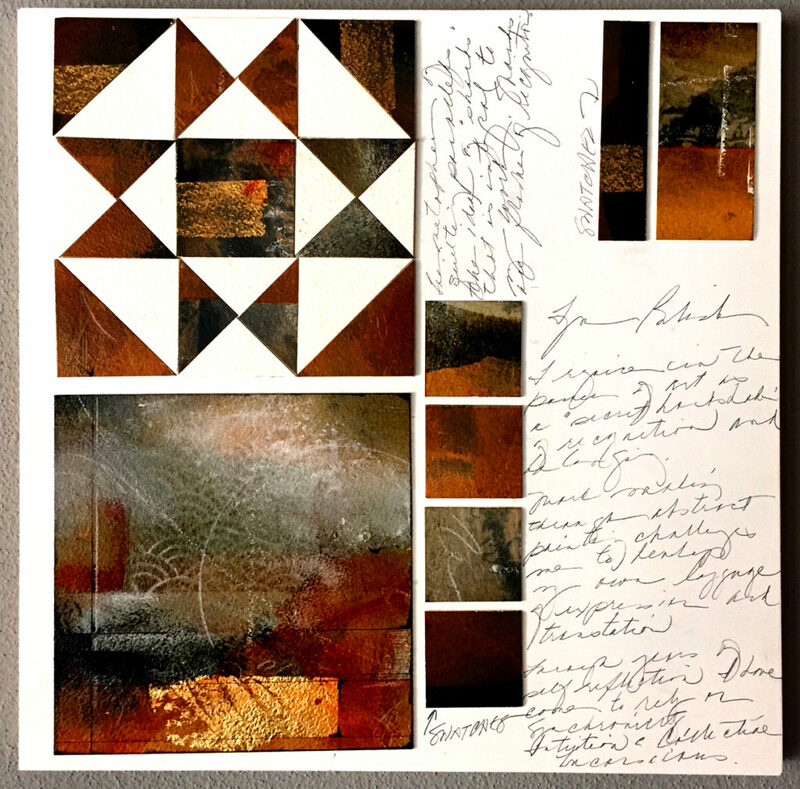 I taught another Wax & Words workshop at my studio yesterday at the request of Pamela Ferguson, who wanted to share the beeswax collage techniques with some of her writer friends. I was curious to see if their work emphasized words more than images and how well they would do with asemic writing – after all, they are in the creative vocabulary business. As usual, there was a eclectic mix based on each participant’s perception and focus. 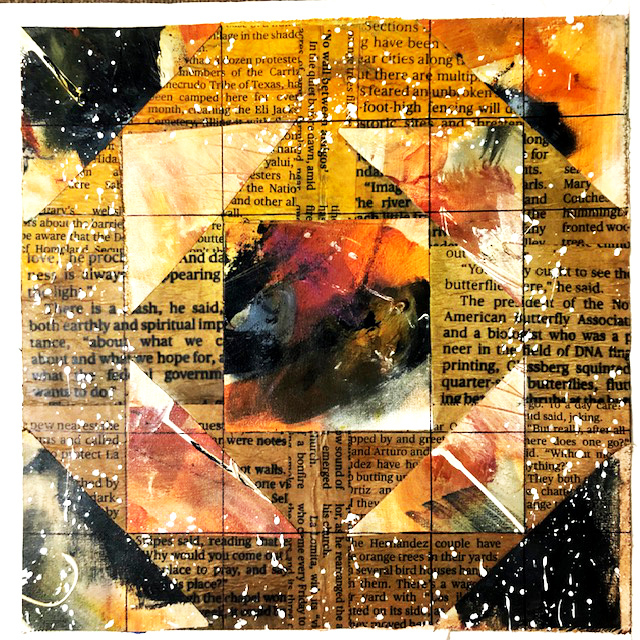 The trick to doing best-practices encaustic college is to use adhesives that don’t block the absorption of the beeswax. Acrylic medium won’t let wax penetrate, so that’s out. I often use glue sticks to attach paper to the substrate before waxing, and asked the participants to try a relative new product called Elmer’s Re-Stick Glue Sticks. The results were just so-so. Edges kept peeling up before we applied the beeswax and needed more glue, but the glue stick did allow us to shift things around a bit before permanently attaching them. I think I’ll stick to my tried and true favorite, Scotch Permanent Glue Sticks. We also made sure that all of the paper we used was absorbent so the beeswax would not just sit on the surface of the collage elements. All of this info will be in the video Wax & Words eBook, which should be available in a couple of weeks on my website.. 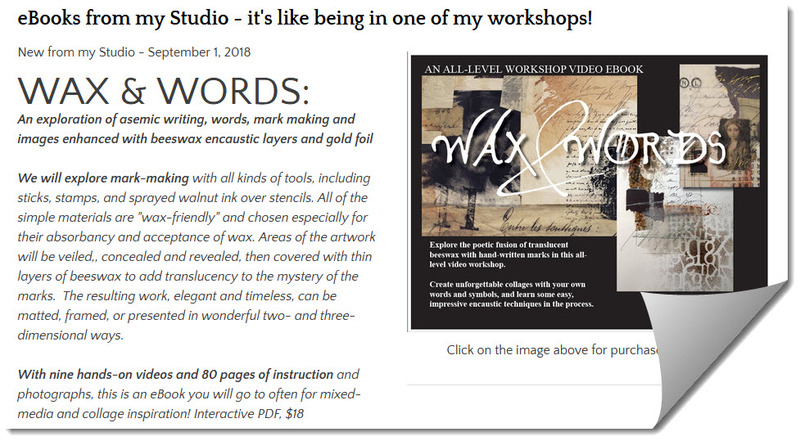 When you watch the workshop video, below, you’ll see the richness the writers brought to their Wax & Words collages. And you’ll also see the completely individual approaches to the task. Always amazing – – – ! 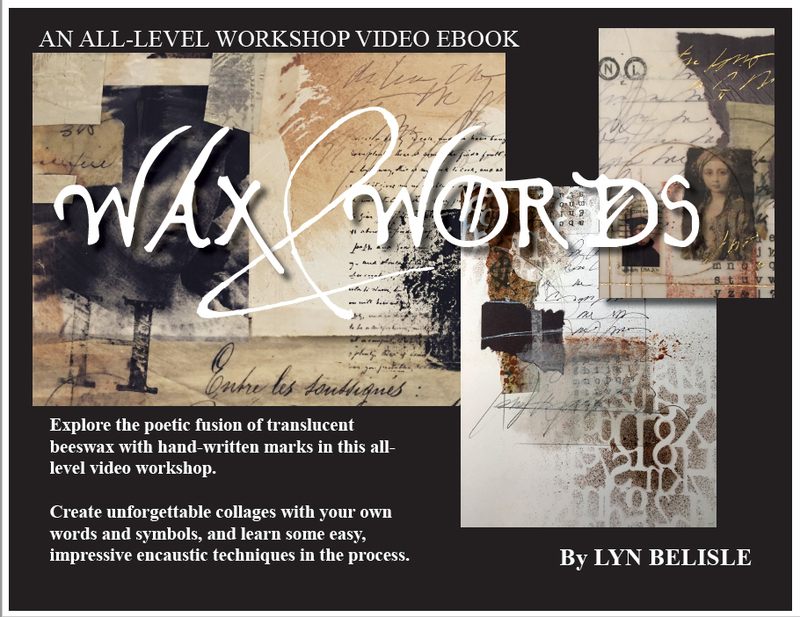 Wax & Words Workshop, Take Two from Lyn Belisle on Vimeo. 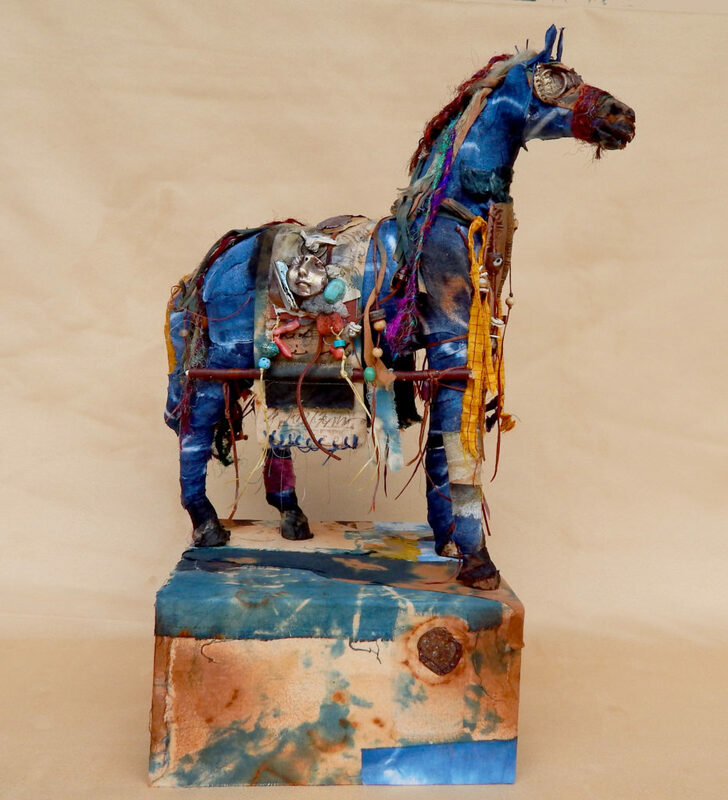 Registration for Artful Gathering opened yesterday – yay! That means I can finally tell you about my two new workshops, never taught before on this planet! (They are supposed to be secret until registration opens). This year’s theme for the Artful Gathering online “summer camp” is celebrating the Southwest, so the first workshop I designed is actually about painting. Even if you don’t consider yourself a painter, this one is super-fun and easy. 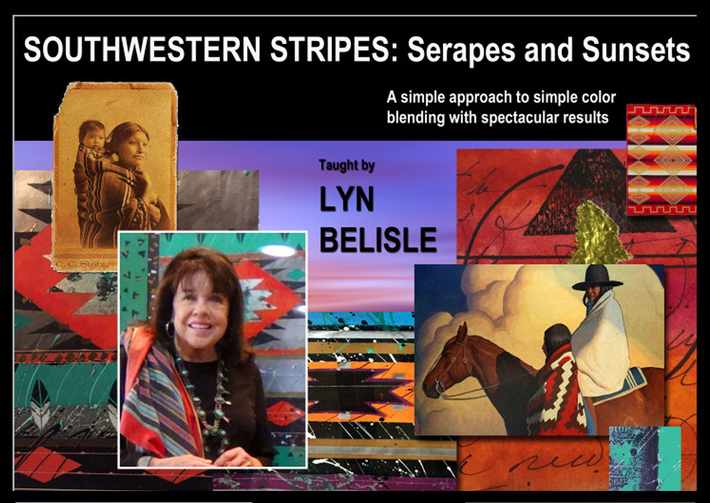 Called “Southwestern Stripes: Serapes and Sunsets,” it explores how simple stripe techniques in several media can come together to make spectacular artwork. 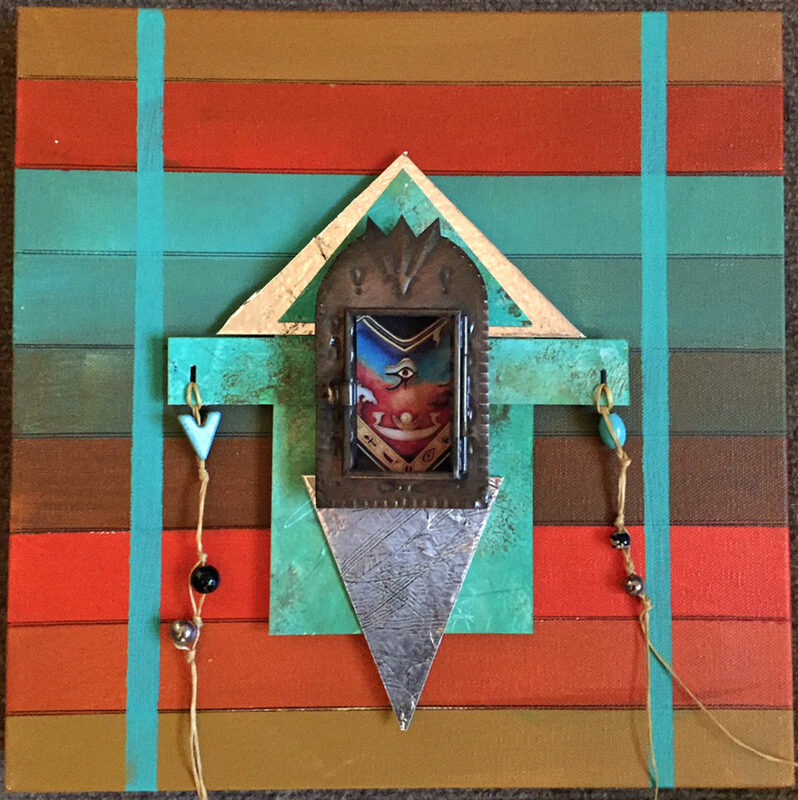 There are over four hours of videos in this class with a ton of projects, including this mixed-media shrine painting on stretched canvas. 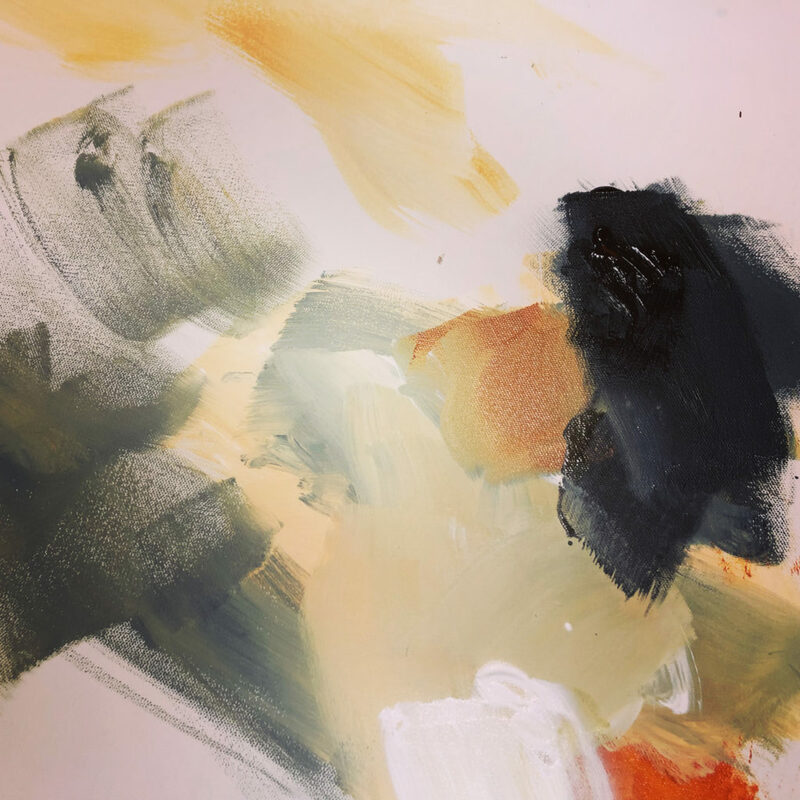 We start out with a very simple series of color studies in watercolor or gouache to portray the four Sacred Elements of Earth, Sky, Water and fire. Here’s “Sky.” These little paintings are totally fail-proof, honest. For more about this class, you can take this link. 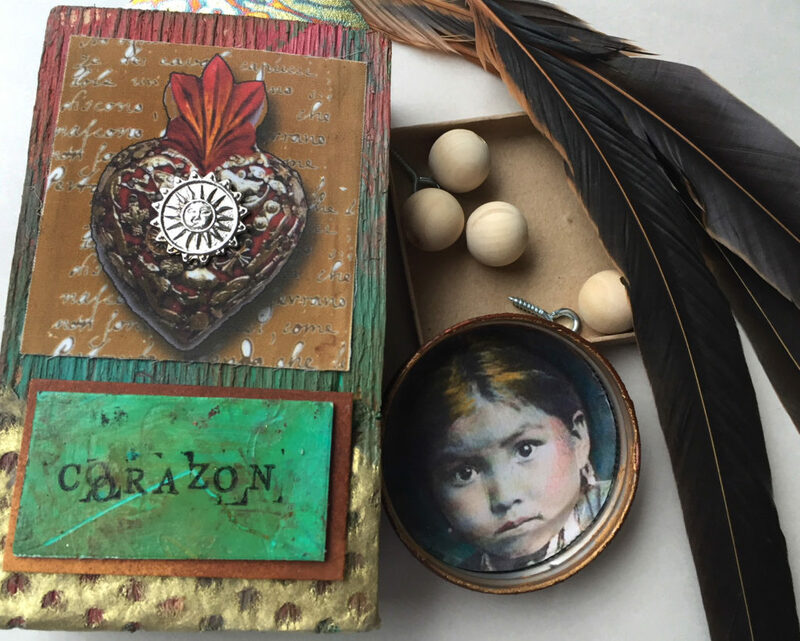 The second class is perhaps my most favorite of all my Artful Gathering workshops. It’s called Neo-Santos: Creating Personal Spirit Guardians. It’s kinda like a spirit doll class, but with very different techniques. 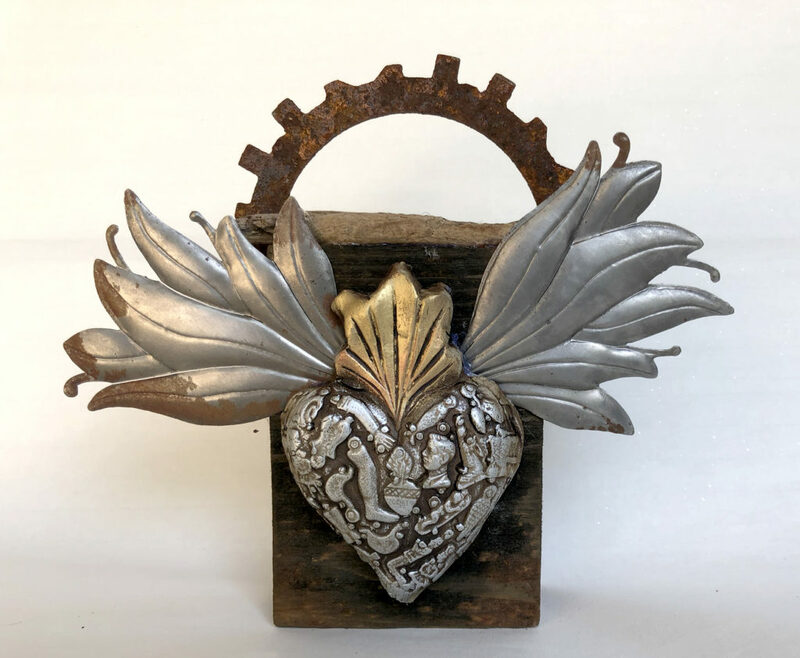 These small sculptures are created from found objects and collages papers, along with all kinds of charms and construction details. Neo-Santos is another 4+ hour class with a ton of ideas, inspirations and techniques. Once the classes are actually open, you’ll download the videos and then work with me and the other students in the online classroom. If you haven’t done this kind of thing before it’s remarkably easy, plus you get the benefit of seeing everyone else’s work and getting specific feedback from me whenever you need it. 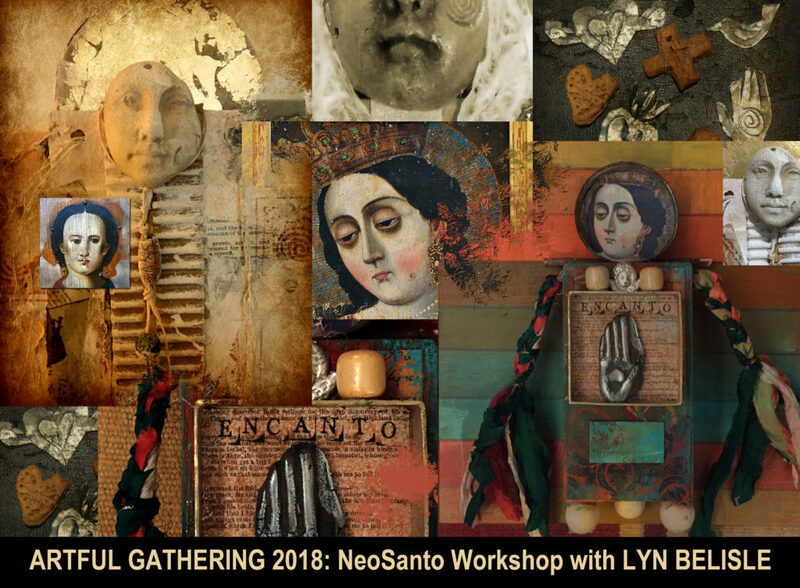 Click here to find out how to register for these classes, and for a bunch of other wonderful classes on Artful Gathering. Hope to see you in class – and if you have questions for me, just send me an email! What is good art? Lots of answers at SAALM! 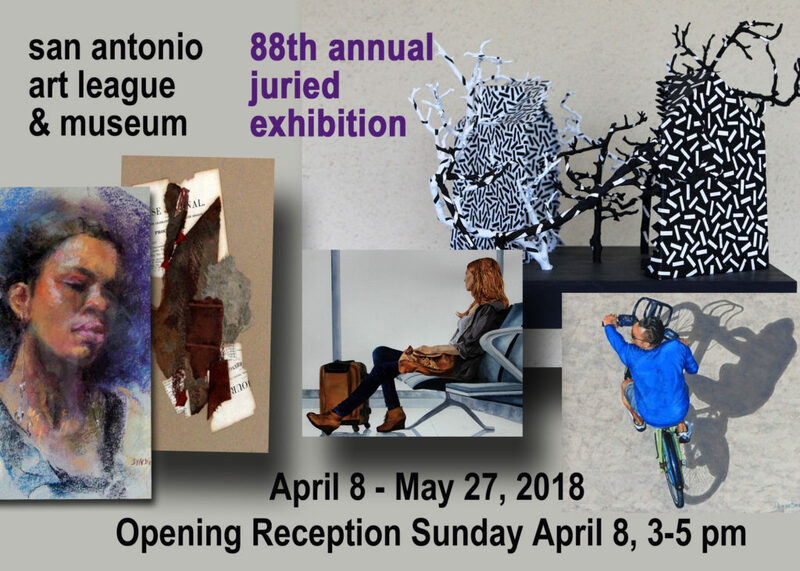 For many months, the committee for the San Antonio Art League’s 88th Juried Art Exhibition has been working toward yesterday’s event – the opening reception and award presentations. As President of the 106-year-old group (but truly unbiased) I gotta say that this show is a solid winner. Most of the 200 guests at the opening agreed. What an amazing, eclectic display of artwork in every media! The quality of art must be measured by how well it performs its intended function. 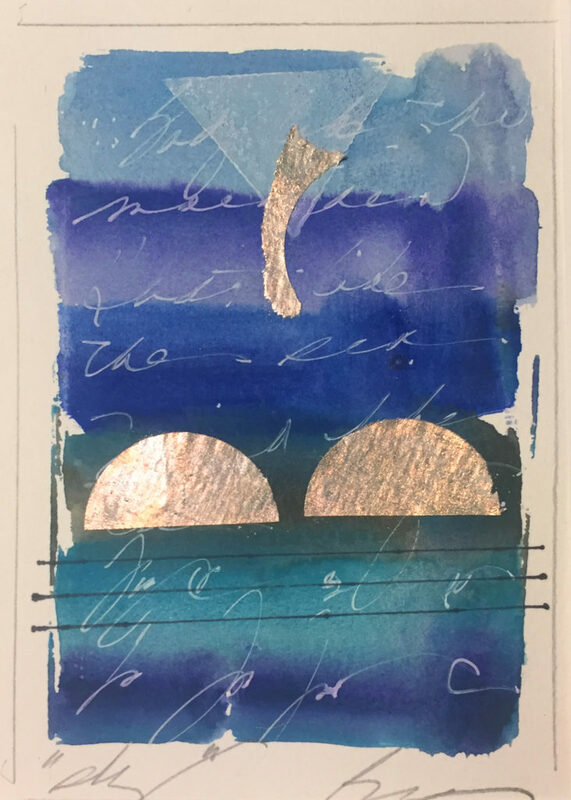 Making that judgment requires an understanding of the relationship between what I believe are the two fundamental components of art: vision and skill. Vision is the ability to imagine an aesthetic object that serves an expressive purpose, while skill is the technical ability to make that object effective in its purpose. Both are worthy and enjoyable by themselves, but in the most effective art they depend on each other and reinforce each other. Unskilled execution always distracts from and eventually discredits even the most profoundly creative vision. A display of technical virtuosity alone can be very exciting, but ultimately we lose interest because it lacks any insight that would nourish us emotionally or intellectually. So, it has to start with an idea – and you have to be skilled enough to share that idea effectively. It’s not enough to look at a flower and paint a picture of it that resembles a photo – there has to be a “why” behind the effort. Take a look at this video showing examples from the just-opened exhibit and see if you can see both the “why” and the “how” of the works. 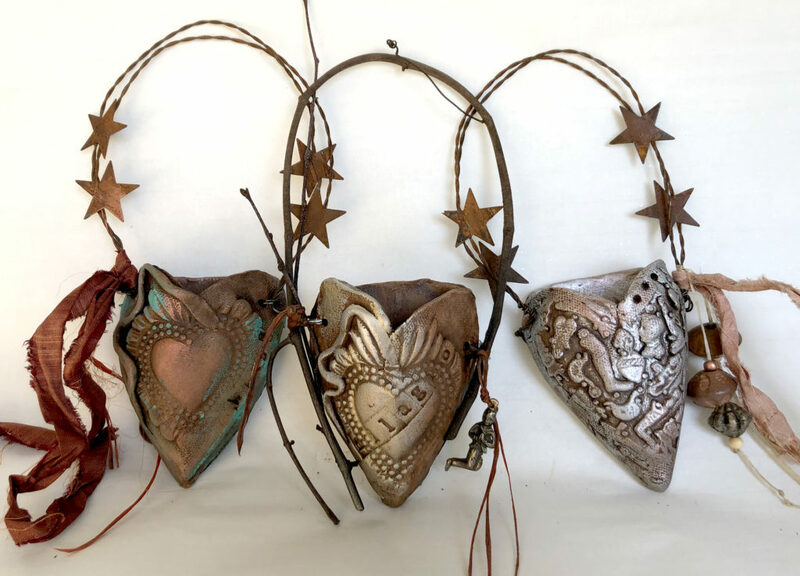 San Antonio Art League 88th Juried Exhibition from Lyn Belisle on Vimeo. I invite you to see the show in person. It’s a learning experience for sure. The San Antonio Art League is located at 130 King William Street (MAP) – free parking across the street (and a great lunch spot, The Station Cafe, just down the block). Admission is always free to SAALM, so bring some friends, see the exhibit, and get some lively conversation going about “What IS art, anyway?”.. You won’t be sorry!